GRANITE PEAK 12,799’-12,801’ (Montana’s highest point) First summited by Elers Koch and Fred Inabnit in 1923, Granite Peak is considered the most technically challenging of the highest summits in the Lower 48. 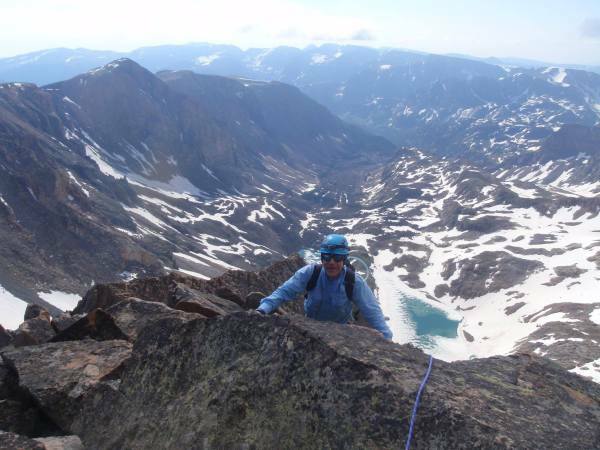 Beartooth Mountain Guides leads 4 or 5 day ascents of Granite Peak via the devious East Ridge. Beartooth Mountain Guides ascends to the base of Granite Peak via Mystic Lake and the Huckleberry Creek drainage to Princess and Avalanche Lakes. From there to the East Ridge by way of the north Granite snowfield. Prerequisites: Rock 1 or equivalent. Tents, meals, stove and fuel, cookware, water purification, helmets, harnesses, ropes/hardware, crampons and ice axes (if necessary). 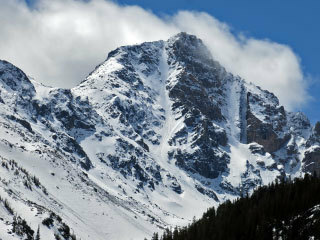 The 5th highest peak in Montana, and a great summit accessed from Sundance Pass. Snow climbing, Leave No Trace and route finding skills for Class 4 terrain are taught. 3 day course covers an 18-mile loop trail–one of the best travel routes in the Beartooths. mostly due to it's remote location. Has a very unique plateau summit with steep relief on every side. Snow climbing, Leave No Trace and route finding skills for Class 4 terrain are taught. 3 day course–2 nights camping at BlackCanyon Lake. This route is possibly one of the best moderate alpine routes in the entire Beartooth Range. 6-7 pitches of moderate rock grades up to 5.6. Snow climbing, rock climbing and route finding skills taught. Stellar views of the Bear's Tooth spire, Black Canyon Lake and Mount Reargard. 3 day course–2 nights camping at Moon Lake. © 2017 Beartooth Mountain Guides, Inc.
At 12,529 ft., Castle Rock Spire is the highest spire in Montana. 3 pitches up the Castle couloir, followed by 5 pitches of alpine rock grades to 5.7. Snow climbing, rock climbing and route findingskills taught. Very remote part of the Beartooth Range. 4 day course– 1 night Quinebaugh meadows, 2 nights near Omega Lake. Previous multi-pitch climbing experience required. The namesake and iconic spire of the range; the Bear's Tooth offers quality alpine climbing with an unrivaled location in the heart of the Beartooths. 8 pitches of snow and rock with grades up 5.8. Snow climbing, rock climbing and route finding skills taught. 3 day course– 2 nights above Black Canyon Lake. Previous multi-pitch climbing experience required. Montana is home to lots of mountains including 26 peaks that are over 12,000'. All of the Montana 12ers are located in the Absaroka-Beartooth Wilderness of the Beartooth Mountains. Your journey to climb or ski all of them starts here!